During an offensive line meeting on Thursday, Jeremy Zuttah impressed his teammates with yet another example of how he had already considered every possibility heading into Sunday's game in Cleveland. The starting center pointed out what rookie reserve tackle James Hurst would only call a "rare front" shown by the Browns this season that would have given the Ravens trouble. The defensive alignment was discussed, and a plan was put in place to make sure it would not lead to disaster. Zuttah's athleticism in the middle of the offensive line has been key to a much-improved Ravens offensive front that has cleared space for the running game and kept quarterback Joe Flacco untouched in Week 2 against the Pittsburgh Steelers. But it's moments like that in the meeting room when Zuttah, the de-facto general of the offensive line, impresses them most. "As the center, you have to be ready for anything," Zuttah said. "You have to kind of take it on yourself to get everybody on the same track for certain things. It's just one of the things that goes with the job." The Ravens traded a fifth-round pick to the Tampa Bay Buccaneers for Zuttah in the offseason and signed him to a five-year, $18 million contract extension to solidify a position that was in flux following longtime starter Matt Birk's retirement after the Super Bowl XLVII victory. Several teammates said Zuttah, an otherwise soft-spoken person, was able to step into a leadership role on the line from the moment he arrived. "He came in here right away in the spring and really took charge," right tackle Rick Wagner said. "That's what you need to do at the center position." Zuttah, who joined an offensive line that was the target of much criticism last season, knew "there was a lot of heat" on the unit last year. He also "knew that guys like Marshal Yanda and Eugene Monroe, who they just signed, were incredibly talented guys, so I didn't see a reason why they couldn't be a good line." But in an entirely new offense, Zuttah found himself on the same level as the team's returners. "What made the transition a little bit easier was it was a new offense," Zuttah said. "When everybody was learning it together, it was kind of easy to take a lead on that. Otherwise, if they had already known it, it would have been a much tougher situation." Zuttah's experience playing both guard positions and center also help him keep the rest of the line in a position to succeed. Yanda said "he's a good football player — you don't need to sugarcoat it." Running back Justin Forsett said he's "a great leader down there in the trenches." Zuttah's progress will be one of several factors that dictate how successful the offense can be, according to offensive coordinator Gary Kubiak. "Jeremy is new and … it's a new system, so the more control he gets of the system — he's the quarterback of the guys up front — I think the better we're going to be," Kubiak said. "I think the key is we're all playing together. We've been out there for every snap in training camp. We've now been out there for two weeks in a row, and you hope that continues. But the more reps they get together with what we do and we keep being repetitive in what we're doing, we should continue to improve upon that standpoint." Through two games this year, his presence has been notable. The Ravens have run up the middle — either between Zuttah and Yanda to his right, or Zuttah and guard Kelechi Osemele to his left — 22 times for 108 yards, according to Pro Football Focus, good for an average of 4.9 yards per carry. That's a touch above the team-wide average of 4.5 yards per carry, and is buoyed by a 41-yard run by Forsett that helped seal last week's win over Pittsburgh. Zuttah and Yanda cleared a gaping lane to the second level for the shifty back. By comparison, Ravens ran between their guards 180 times in 2013 for just 575 yards, which was in line with the team-wide average of 3.2 yards per carry. Pro Football Focus has Zuttah graded as the fifth-best center in the league this season. Gino Gradkowski finished last in those rankings in 2013. 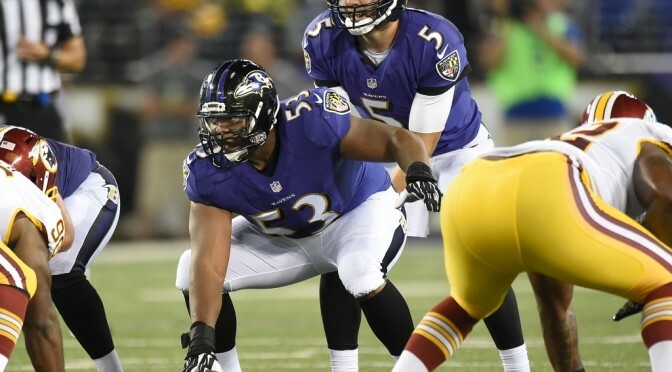 "Playing between Marshal Yanda and Kelechi, it makes my job a lot easier," Zuttah said. "I think we can be as dominant a force as we want to be. We've just got to keep growing together and make sure we're on the same page with a lot of stuff."